Caltech's Computation and Neural Systems Department (CNS) in conjunction with Hebrew University organized a conference in Eilat, Israel. And this was the spawning point of my trip, some of whose highlights are below. These are just the highlights of the trip -- I don't have the time (and neither do you, most likely) to go through 170 slides and descriptions of a 2 week trip (ok, so only about 10 days are worth describing...) All pictures are scanned from slides (Kodachrome 60, Ektachrome 100, Ektachrome 400). 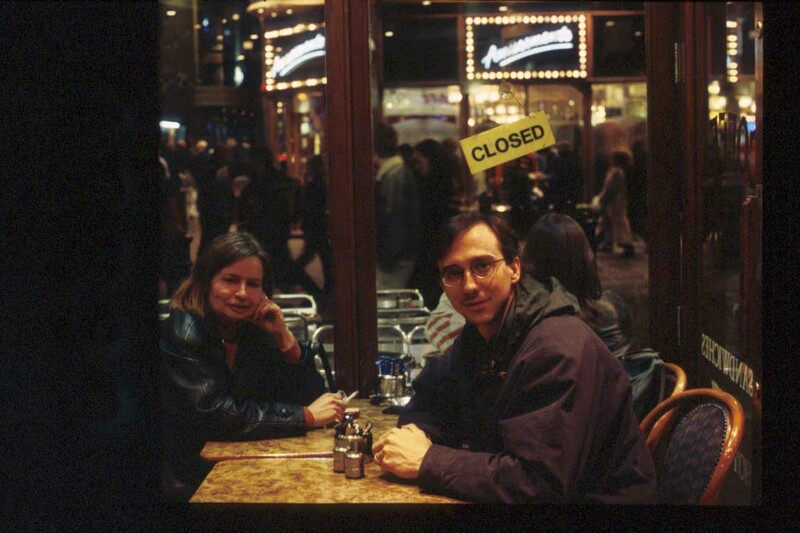 Maryla, my cousin, and Javier Perez-Orive, another CNS grad student, sitting in a cafe in London. He and I had a 10 hour layover and took the opportunity to ride double-decker buses around the city with my cousin, who lives there. Eilat, Israel is almost a twin city with Aqaba, Jordan. Jason Davis (a fellow first-year CNS student) and I took a cab to the border, and another from Aqaba to Wadi Musa. 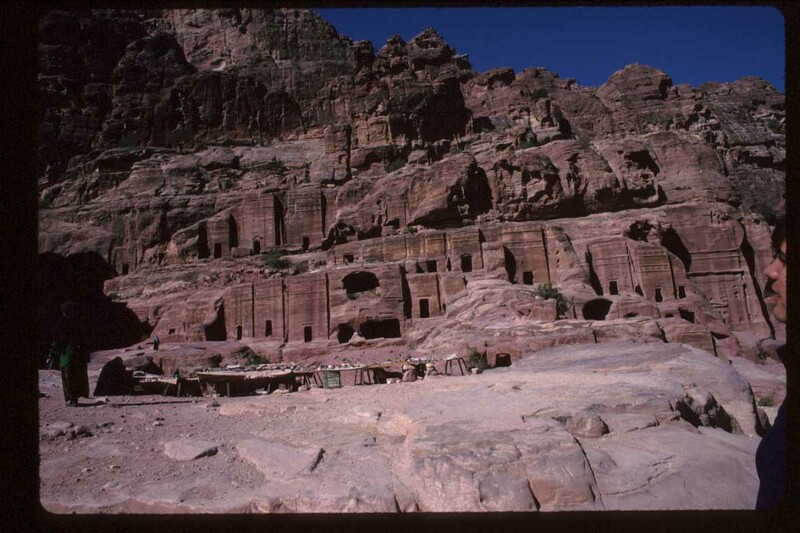 We spent the night in a hotel and the next morning and afternoon in the ancient city of Petra. 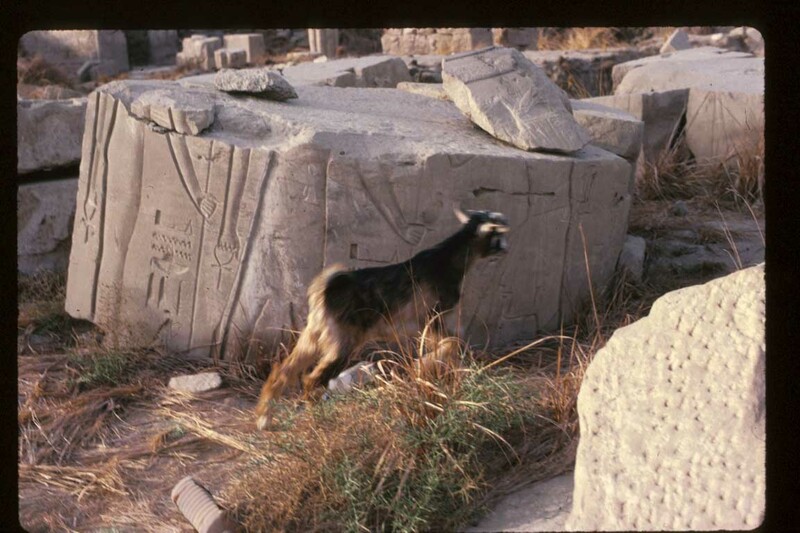 (I'll try to recall dates as best I can...) It was first inhabited about 400 BC, and in 300 BC the Nebateans moved in. 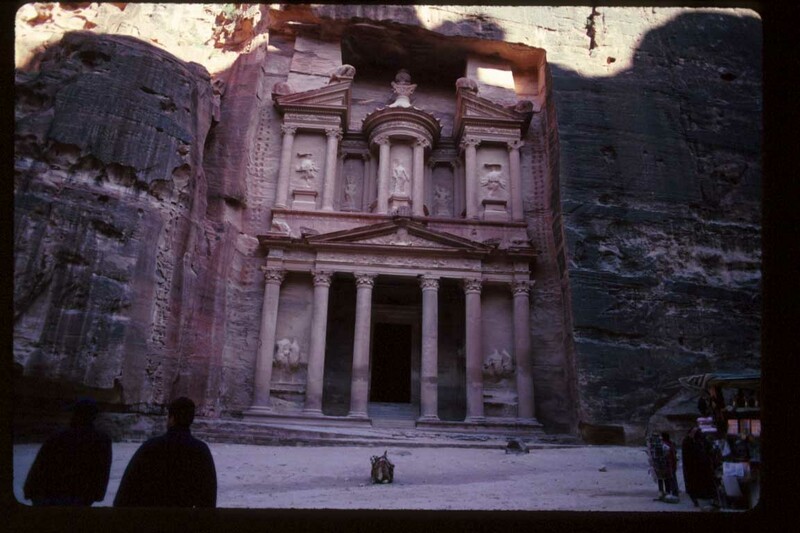 They are the creators of the buildings carved in sandstone. The treasury shown here is one of the most famous ones. I must admit: only two of the other structures we saw there were equally elaborate (the Monastery and the Ampitheater). This building, like the other elaborate ones, was a place of worship. This one contained a tomb and place for preparing the dead, three rooms in all. The second floor is only a facade. This building is the first thing the visitor sees upon exiting from the Siq, a narrow canyon with vertcal walls, and the only entrance of the city -- which is why it was so easy to guard and so difficult for the Romans to take over. In about 106 AD, the Romans finally succeeded. Walking along the Siq, the remnants of the old Roman road are still visible, as are places where they build up walls blocking the entrance to some of the Nebatean tombs. They also added some of their own structures to the city further on. 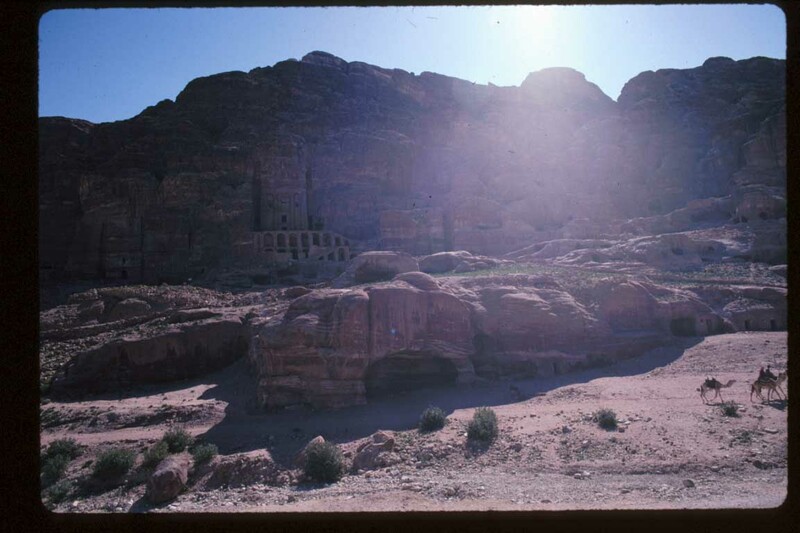 These are some of the less elaborate tombs in Petra. In front of them, Bedouins set up tables to display their wares to the throngs of tourists (who have not yet overtaken the city, as it's still morning). Looking east from much further down the canyon, we see a wall whose entire length consists of buildings carved by the Nebateans. The columns visible just to the left of center were added by the Romans. And the camels in the foreground are modern -- actually, camels didn't come to the area until some time in this millenium, but I don't remember when. 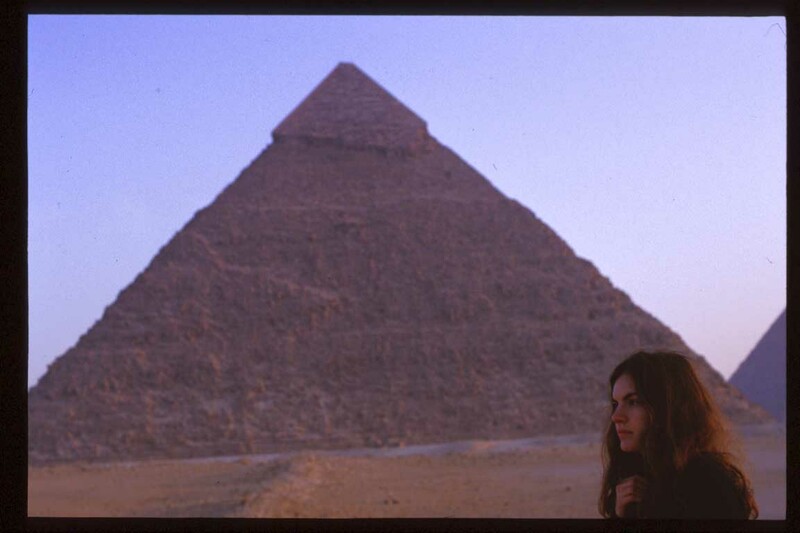 Daniella Meeker, in front of the largest of the six pyramids at Giza. After the conference in Eilat, a group went to Sharm el-Shaikh in the Sinai peninsula. Javier and I SCUBA dove in the Red Sea; Alex Backer SCUBA dove independently of us; and the rest of the bunch snorkeled. 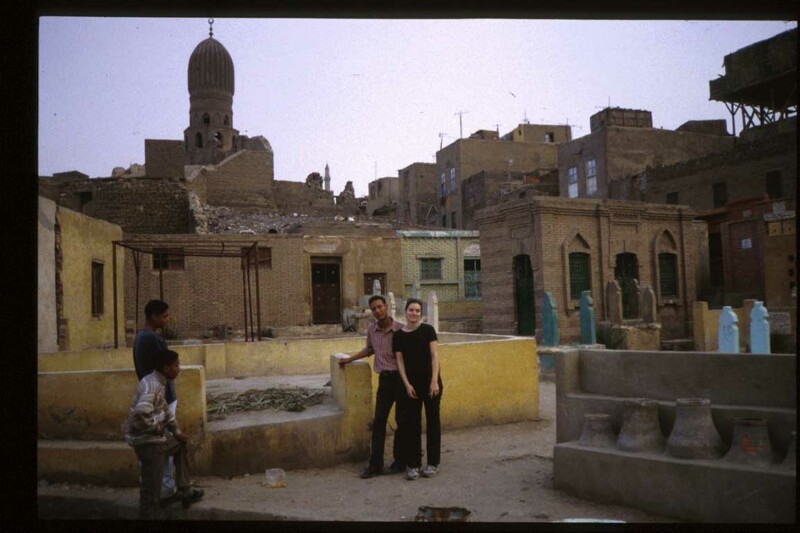 We only spent one day there and within 28 hours of our arrival, Daniella and I were on the night bus to Cairo. We arrived at 4:00am and took a taxi to the pyramids at Giza, arriving at 4:30. Thanks to a bribe-thirsty slightly drunk Arab, and tourist police who also hoped for some payoff, we were led onto the premises almost 4 hours before the official opening time. After some time trying to convince us to spend $50 each for the opportunity to touch the Sphinx (we declined), our guide led us through areas that would later be open to us with an official 20 Egyptian pound pass. Watching the sunrise over Giza, the pyramids around us, and the morning Muslim prayers starting was an amazing experience. The Muslim men sing, the women wail... It's beautiful. Our guide suggested that perhaps we'd like to climb one of the pyramids (the third largest). We happily accepted and started climbing. 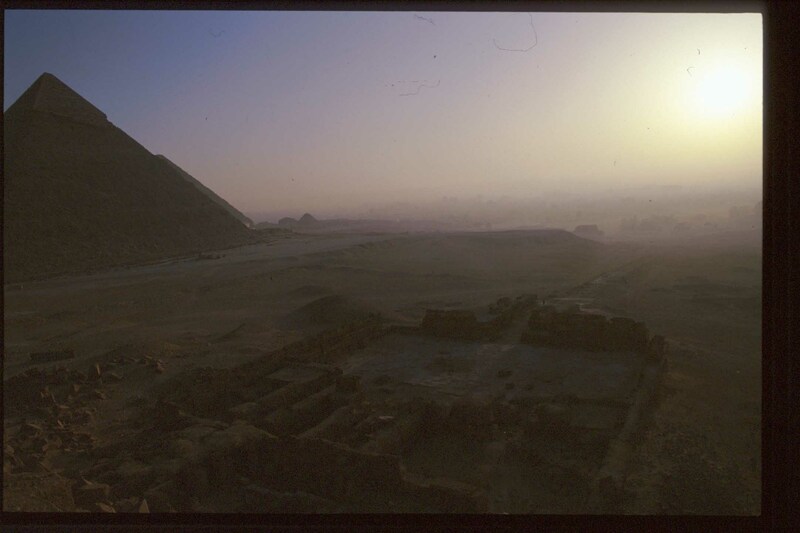 From halfway up (when a tourist policeman approached and asked that we come down), I took this photo looking towards the sunrise and with the Pyramid of Cheops (the largest) in view. I also took the next photo of the three small pyramids from here. Entrance almost anywhere can be bought with bribes. The morning excursion through the pyramids cost us 30 Egyptian pounds, although the guide had clearly hoped for more, as did several tourist policeman who later asked us how much we'd paid. 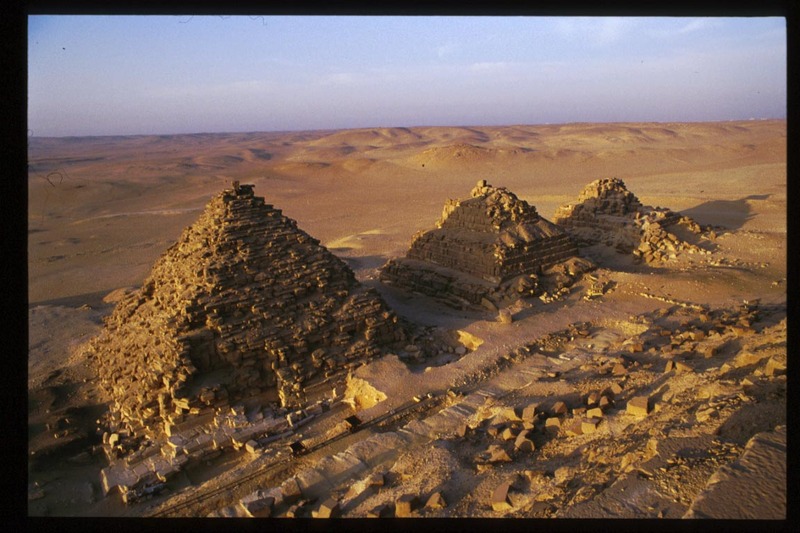 The three small pyramids of Giza at sunrise (there are 6 total). This Arab man insisted I take a picture of him. 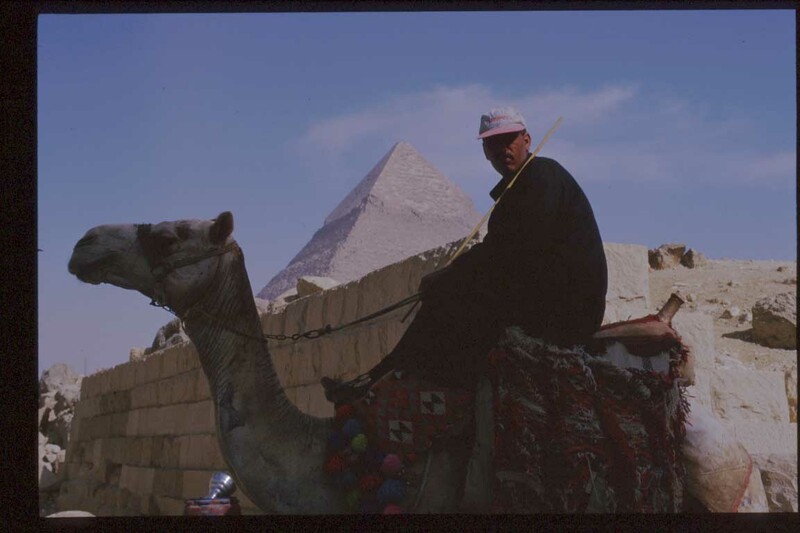 Many such men can be seen at the pyramids offering camel rides to tourists for a few Egyptian pounds. The tourist police also ride camels. 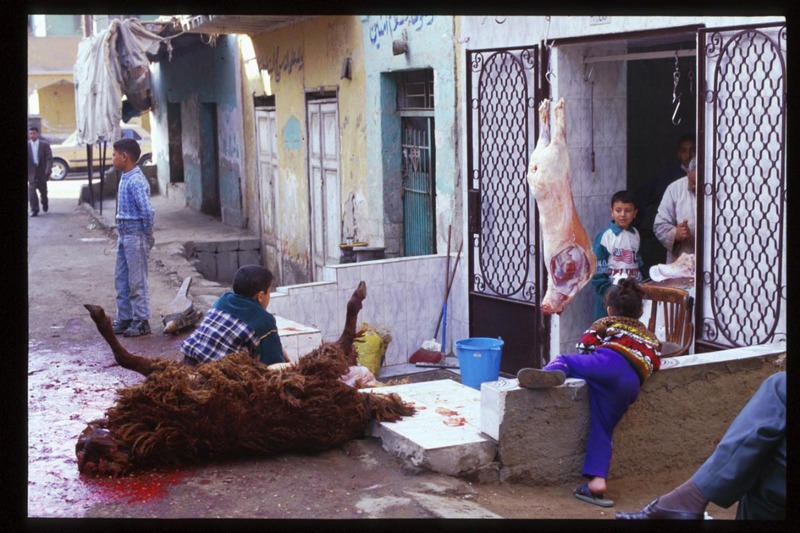 The City of the Dead, in Cairo. In this rather poor part of town, many families live in brightly painted tombs. The local in the pink shirt standing next to Daniella was an off-duty tourist policeman, who kindly gave us a free tour of the City of the Dead, a nearby market, a mosque, and his home. He also helped me find a belly-dancing outfit for sale, while to Daniella he offered services of another kind: "Just one night", he insisted. This is from the Karnak Temple near Luxor, Egypt. 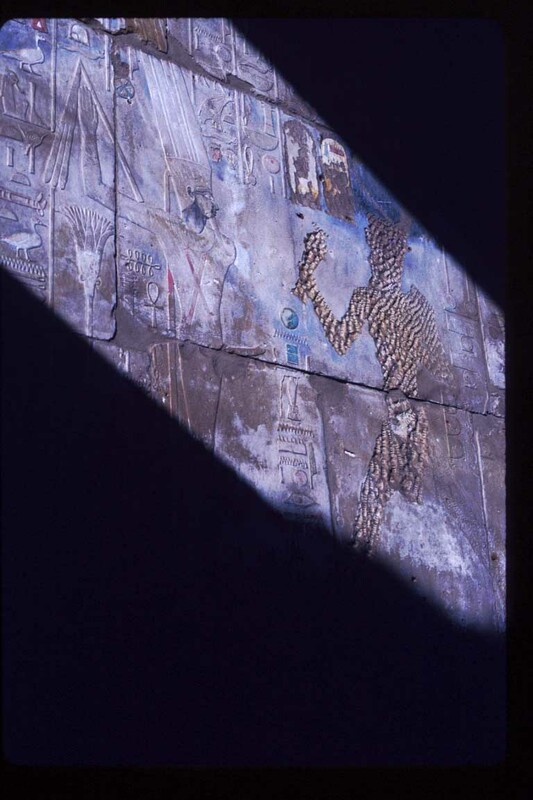 In the sunlit part of the image, you can see what used to be an image of Queen Hatshepsut. She was the only woman Pharoah, and in fact wanted to be called a king and wore a beard. Although she treated her son well, he was resentful of having to wait for her to die before becoming Pharoah himself and removed her images and references to her everywhere he could (a notable exception is in the Valley of the Kings, where Hatshepsut is represented as the Sun God, and to deface her statue would have been considered sacrilege.) In this wall of hieroglyphics, you can clearly see where her image was chiseled away. Jerusalem is holds a unique combination of structures, the oldest being segments of a Roman road, the newest having been constructed by Jews since Israel became a country, and the inbetween being Arab, Christian, Armenian, Ethiopian, and perhaps even a bit of something I didn't see. 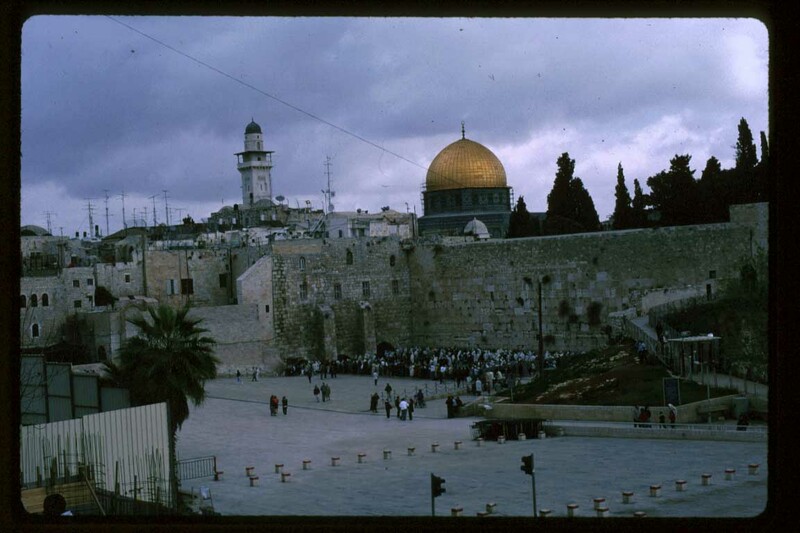 The large dome in this picture is the Dome of the Rock, where Muhammad supposedly ascended to heaven. It is a beautiful, elaborately decorated mosque with a large rock in the middle, and a cave-like room beneath the rock (where people can and do pray). No one may walk atop the rock. In the foreground of the photo is the Wailing Wall, a remnant of a Jewish temple. We arrived in Jerusalem on Passover. Although it is possible to wander in the plaza, no photos are allowed on holidays -- so this is the closest I could come and snap a shot. The area just in front of the wall is fenced off to separate the praying faithful from tourists like us. As you can see, that area is full (and as you can't see, it's segragated by gender: men on the left, women on the right). Most of the Jews are dressed in traditional Hassidic garb, and most are men.